What do a field of ponies and the Atlantic Ocean have in common? They are the two things worth mentioning in this post. Look at all of those ponies! We hopped on the Euro Velo 1 as we approached Spain. 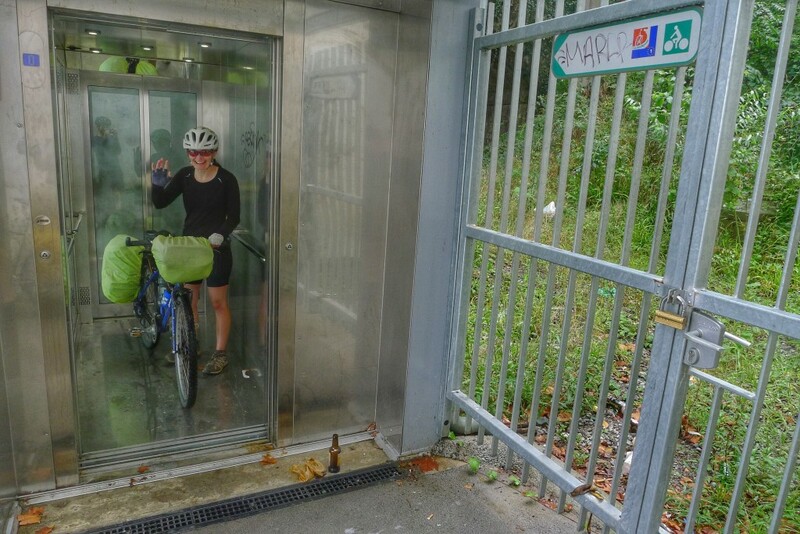 The route had a dedicated bike elevator. We lost the route a few times through the city of Biarritz. We were thus penalized and rewarded by this step climb away from the beach. We’ve been following rivers downstream for the past week. Today was no different. But until today the river trails and roads didn’t offer much to look at except, of course, the rivers and walls of corn. So when we rounded another bend and the corn wall to our right gave way to an open field with small cows, it was something unique to look at. “Hey Baby, look at those small cows,” said I. 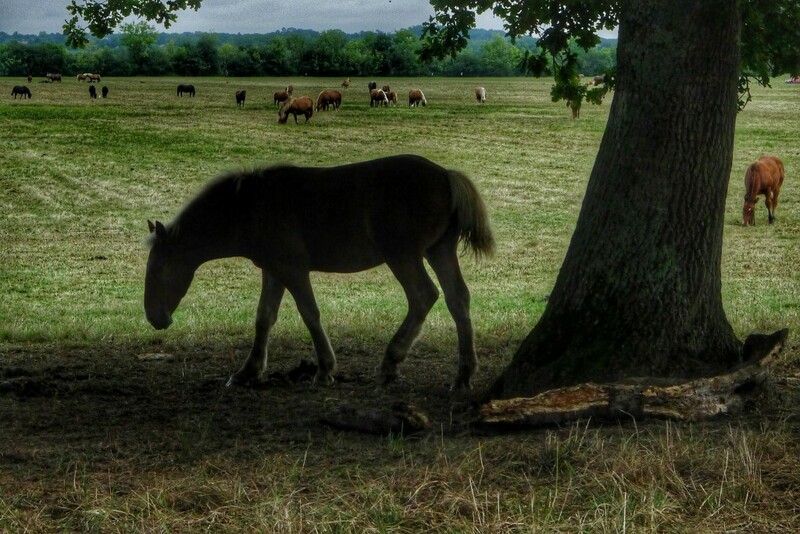 And then taking far too long to realize that there’s probably no such thing as small cows, I deduced that the grazing beasts were in fact ponies. A field full of ponies. Grazing ponies for as far as the eye could see. It was the stuff of dreams. After the field of ponies we went back to staring at the river and corn. It was river and corn for a couple more hours until we caught sight of the Atlantic Ocean. 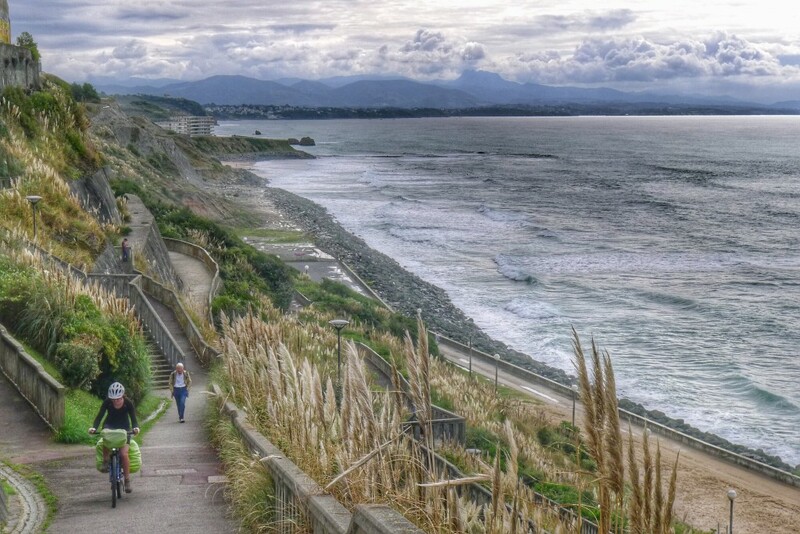 We passed through the tourist haven of Biarritz. Surfers were riding the waves near shore as the great blue pond stretched out to the horizon. Today would be our last full day in France. For the past five weeks we’ve been enjoying the French countryside. It’s truly a great place for cycling. We also reflected on how little we’ve really communicated with other people here. Sure, we learned enough French to check in at campgrounds and hotels and to buy groceries. I bet our understanding of French at this point is at about the same level as a dog. We get excited when we recognize a few key words, but most of the time we’re getting by by watching body language. That’s why going to Spain has revitalized our excitement to travel. In Spain we can have actual conversations. Well, Carrie can. I’m still at about kindergarten level. But at least I’ll be able to pronounce the words properly. I can see the people I talk with cringe a bit when French comes out of my mouth.